Former players and state media questioned the credentials of the 2006 World Cup winner and world player of the year, who is yet to claim a major trophy as a coach. Cannavaro will remain in charge of Chinese Super League giants Guangzhou Evergrande. FABIO CANNAVARO’S FIRST task as China coach may be to win over a sceptical public after his appointment was met with criticism and even anger. 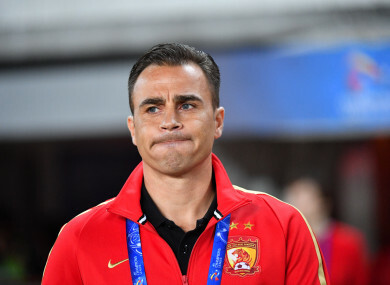 The Chinese Football Association has not made it clear if it was a permanent or temporary role for Cannavaro, who will remain in charge of Chinese Super League giants Guangzhou Evergrande. “In his time as a player, Cannavaro was great, but as a coach, he still has achieved nothing,” the Youth Daily commented, saying his appointment had “caused public uproar”. “Cannavaro’s achievements as a player are undisputed,” former international Li Yan told the newspaper. The 45-year-old Italian’s ascension to the post — with mentor and predecessor Marcello Lippi remaining as an adviser — was widely predicted in Chinese media. But sceptics said the former Juventus and Real Madrid centre-back has done little to prove he deserves the job after it was confirmed in a low-key announcement late last week. In Cannavaro’s first full season with Evergrande last year, the southern team relinquished their seven-year grip on the Chinese league trophy. Previously, Cannavaro had a seven-month spell with Evergrande before being sacked in 2014, and won promotion with Tianjin Quanjian in 2016, steering them to third in the CSL table the following year. “(His) familiarity and understanding of Chinese football may be his greatest advantage,” the Youth Daily said, echoing the words of the CFA when they named Cannavaro. He also has a good record bringing through youth players, the newspaper said. Some media speculated that the hosts’ two games in this week’s China Cup will be an audition for the former defender to get the job permanently. Eight Evergrande players were named in the squad ahead of Thursday’s clash with Thailand and Monday’s game against Uzbekistan or Uruguay. But Li warned that the overwhelming Evergrande presence in the squad might cause problems with players from other clubs. China and Cannavaro — if he lasts beyond the next two matches — are building towards the qualifiers for the Qatar 2022 World Cup, which begin in September. China have reached the World Cup only once, in 2002, when they failed to win a point or even score a goal. The Guangzhou Daily noted that Cannavaro’s appointment came just days after Evergrande were humbled 3-1 by South Korean newcomers Daegu in Asia’s Champions League. Shanghai-based Oriental Sports Daily was scathing about Cannavaro’s dual role. “If this part-time job becomes the norm for a long time in the future it is absolutely not the norm — and nor should it be,” it said. Email “'Public uproar' - critics round on Cannavaro over China role”. Feedback on “'Public uproar' - critics round on Cannavaro over China role”.